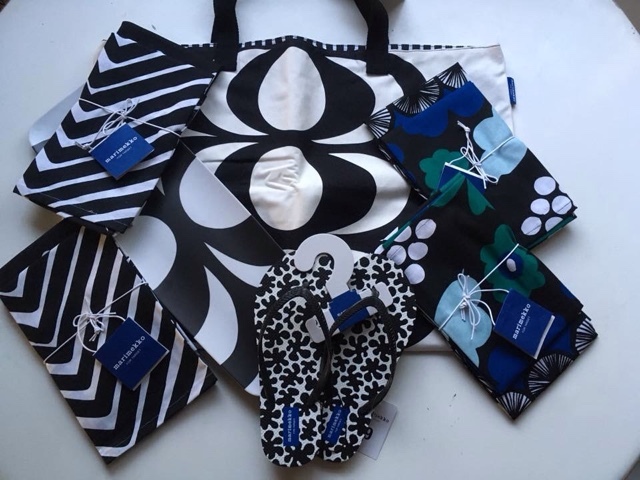 vintage+little: Marimekko for Target arrived! Such a happy day: my Marimekko for Target loot finally arrived from the USA! A friend of my husband's kindly let me ship it to his house in California, as Target don't ship internationally. (Target Australia, you should really rethink a collab with Marimekko). Everything is amazing and such beautiful quality that I really wish I'd bought more. I tried to stick to practical and light to ship stuff, which meant no hammock, boogie board or tents unfortunately! The best things are the tea towels, I'm so glad I bought four. They are great quality, thick cotton. The bag is also lovely - and HUGE! It'll be great for Summer. I love the flip flops, or thongs, as we call them in Australia, although the print will be hidden underfoot when I wear them. Boo. The platter is nice but probably the only thing I don't loooooove. I'm glad I didn't buy more platters, as I was definitely considering buying lots of these pieces. They are melamine, which is great for picnicware, but the print isn't super great quality. I don't know, it looks a little faded. Don't get me wrong, I like it. It just doesn't seem as good quality as the other pieces, which are very impressive, considering the Target price tags. I'm a very happy camper all in all though! Yay Target for Marimekko, an overall thumbs up! I always try to make some match with my dress and components, basically watch and shoe.